"A peppery, kicky, Cambodian fish dish that you'll love at first bite." Heat oil in a large skillet over medium heat. Cook and stir ginger in the hot oil until slightly softened and brown, 5 to 7 minutes. Add catfish fillets; cook until firm, about 3 minutes per side. Remove fillets from the skillet to a plate and set aside. Stir fish sauce, soy sauce, and oyster sauce together in the skillet. Add onion and red bell pepper; cook and stir until softened, about 4 minutes. Return catfish fillets to the skillet and spoon sauce and vegetables over the fillets. 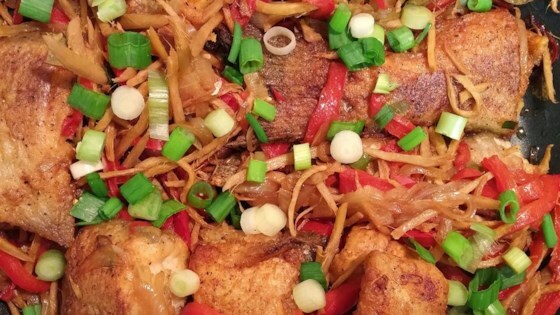 Continue cooking until the flesh of the fish flakes easily with a fork, about 3 minutes more. Garnish with green onions to serve. Very good. The fish was moist and tender and cooking the ginger mellowed it out nicely. Had to reduce the amount of ginger but other than that, very tasty. Love the taste. It came out perfect. I reduced amount of fresh ginger as one of the reviewers suggested. Definitely will make it again. I really liked it, but my kids did not like it at all. Didn't have oyster sauce so used an extra tablespoon of soy sauce. Didn't make much sauce but enough. I added maybe 3 teaspoons sugar, a teaspoon of liquid smoke and less ginger but alot of ginger powder with a dash of red chili pepper and it came out superb. Great dish! I just made this recipe. It turned out very well, loved it. however I don't care for yellow onions so I simply added a few extra green onions.